By Strategic Human Resources, Inc. Turnover is challenging, costly, and could be occurring for different reasons. In order to solve the problem, we need to understand why it’s happening. If you’re able to conduct exit interviews with those who are leaving, that can be a great way to shed light on the reasons for their departure. If exit interviews aren’t feasible to do, we would suggest reviewing your recruiting and onboarding processes as a starting point. Take a critical look at your job descriptions, job postings, screening criteria, interview questions, and background information that is shared with candidates. Are the job details, expectations, and work environment portrayed accurately? During the recruitment process, it is imperative to be transparent about the job, your company, and the hiring manager. If the job is a dirty, hot job, so be it – tell them. If the hiring manager is highly demanding, make that known during the recruiting process. If an employee has a realistic preview of the job, they aren’t surprised and are less likely to leave quickly. A good onboarding plan is exactly that – a plan! 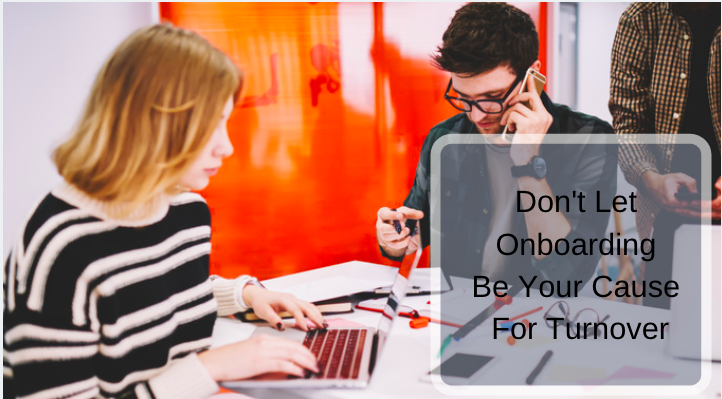 Onboarding doesn’t just happen organically, rather you have to plan for all of the information, tools, resources, and training that will be needed in order to set your new employee up for success in their new role. In a recent article, we shared the key components of a good onboarding plan, which includes suggested steps for you to take BEFORE the employee’s first day. Inform your new employee about the company policies and procedures that affect their work including: payroll/pay schedule; time tracking; list of benefits/perks and how to enroll; keys; equipment; handbook; emergency procedures and contact numbers; time off including breaks, sick days, vacation days, holidays; dress code; smoking policy; parking, etc. This may include a job description; an organization chart; reporting structure; procedures manuals; and performance evaluation process. Another key to successful onboarding is assigning a mentor or buddy for your new hire. In the same BambooHR study, 56% of the respondents said they want to have a mentor/buddy. A mentor can be an important resource to help acclimate the new hire to your company and their new job. The role of this person should include being a source of information (i.e., introductions, company lingo, unwritten rules) and providing guidance on the job (i.e., clarifying assignments, tools, resources). Having open, two-way communication from the beginning will help to ensure that your new hire’s questions and concerns are addressed, and it allows you to provide timely feedback and guidance on their performance. Set milestones to check in with them to be sure they are oriented effectively, integrating into the job, utilizing the onboarding plan and performing/reviewing where they should be. Seize the opportunity to leverage your new employee’s excitement, energy, and readiness to learn. This is a critical moment to shape how the employee approaches their job and how they feel about your organization – both are important links to their retention. Strategic Human Resources Inc. is a national full-service HR management firm based in Cincinnati, Ohio. Its president and founder, Robin Throckmorton, can be reached at Robin@strategichrinc.com. Should you consider a skilled trade instead of a traditional college?